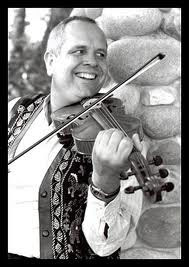 A fairly recent transplant to the San Francisco Bay Area [July, 1994], Erik Hoffman spends his time calling Old-Time Country Dancing, playing music (fiddle, guitar, voice, mandolin, bodhran, and other odds and ends), and tutoring math. Erik became interested in traditional music and dance when he returned to his home town of Santa Barbara in 1980. Friends dragged him to the contra dances, and he became addicted. In 1985 he called his first dance. When San Luis Obispo wanted to start a monthly dance series in 1986 Erik also loves leading dances for families and children, like the (late lamented) Petaluma dance. Versed in dances for kids of all ages as well as singing games and music play, Erik shares the fun for all. He has led family dances and children’s programs from Berkeley to England. Traveling all over the state, Erik has become well known from Arcata to San Diego, and from Carson City, Nevada, to the Bay Area. He has also toured the United States extensively, on both coasts, and in between. He has been staff at a number of festivals, including the Bay Area Country Dance Society’s American Week, Family Week, and Spring Weekend (Monte Toyon); CD*NY’s Hudson Guild; Sacramento’s Echo Summit; California Traditional Music Society’s Solstice and New Year’s festivals; San Luis Obispo radio KCBX’s Live Oak Music Festival; New Mexico Folk Music & Dance’s Memorial Day Weekend; and Seattle’s Slugs at Sunrise Music and Dance Camp. In 1987, Erik took up the fiddle. Erik loves the spirit and joy that is passed along with traditional music and dance, and loves to share his enthusiasm. We’ve been providing sales, service, and more to the Vallejo area for over 26 years. Now offering a recording studio and rehearsal space, we’ve got everything you need! Check out our About Us page for more information on the history of Consumer Music. ©Copyright 2019 Consumer Music .All Rights Reserved.